I hadn’t defrosted any meats for dinner, nor was i in the mood for pasta. That pretty much left some kind of seafood since it defrosts quickly. 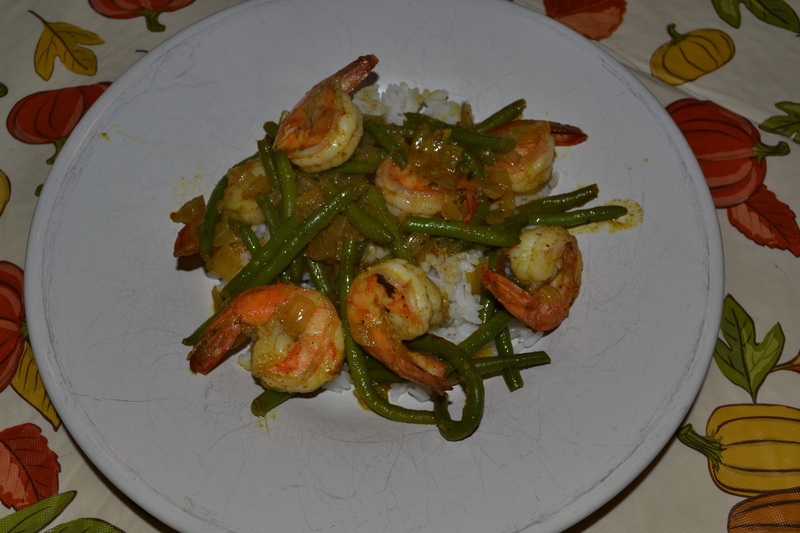 I had put aside a few shrimp recipes and finally decided on a thai red curry shrimp. I boiled up a pot of sushi rice and went to get everything i needed for the recipe. I realized there were no limes in the fridge. Usually i would substitute or leave an ingredient out if I don’t have it, but lime is a pretty strong flavor and very thai. So off I went to the next recipe which was the bombay shrimp. It was pretty good, had good kick, but definitely missing something! I think it was garlic but I can’t be sure! Also the recipe called for coconut milk in the rice, but I had already made the rice so that was missing. 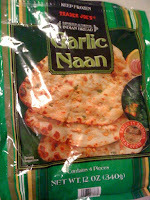 I ended up eating it all with some tj’s garlic naan. 1. Heat a Dutch oven over medium-high heat. Add 2 teaspoons oil; swirl to coat. Sprinkle shrimp with 1/8 teaspoon salt and black pepper. Add shrimp to pan; cook 2 minutes on each side or until done. Remove from pan. 2. Reduce heat to medium; add remaining 3 teaspoons oil; swirl to coat. Add onion; cook 2 minutes, stirring constantly. Add 1/2 teaspoon salt, curry powder, and next 3 ingredients (through red pepper); cook 1 minute, stirring constantly. Add hot water and peas and carrots; bring to a boil. Cover and reduce heat to medium-low; simmer 4 minutes. Return shrimp to pan; cook 1 minute. 4. Place about 1/3 cup rice on each of 4 plates; top each serving with about 1 cup shrimp mixture.